One of the most recent and most open sources of current information and commentary are internet blogs managed by nonprofessional commentators. Though many blogs, especially those collected on major social networking sites, simply recount the mundane events of an individual’s daily life at length and along with motley collections of blurry pictures, the most popular and sustainable blogs are more than this piecemeal kind of life display. Popular blogs are those that make meaningful social or political comments upon some aspect of modern life that readers find relevant. This area of commentary can be anything from hard-hitting political news to actresses’ latest fashion faux pas, a photo commentary of the losses of war or a coded satire of television’s stars. What is most interesting about this form of social media is the openness it offers, not only to commentators but to those who wish to respond to them. For serious bloggers, blog submission allows them to collect and comment upon what they wish immediately and without the hassle or cost of publication; it also circumvents the necessity of qualifications and experience. However, because of the very nature of blogs, bloggers also put their ideas out on the web where they are continually open to instant response from anonymous readers. 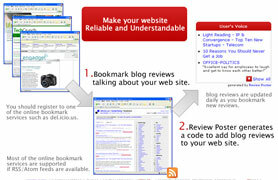 These responses come most often in the form of reviews submitted with the ease of clicking a button. Generally, these are submitted casually and, much to the consternation of English teachers everywhere, with little concern over grammar and syntax. Still, they serve to convey the meaning of their composers. This meaning, though, is often vague or, to put it bluntly, vapid. Due to the nearly complete cover of electronic anonymity offered by the World Wide Web, blog submissions are often crude or thoughtless, and sometimes spring from emotions generated by the original post but not given time to settle. However, one should not discount this form of media due to these facts or their initial confrontation with it. Tucked among the reviews filled with text-speak and attacks are often gems of insight and genuine social critique. Sometimes these reviews rival or even surpass the blogger’s own skill with words and resemble the text of a published author (which one often suspects these commentators might be). They can be witty, provoking, or even astounding in their clarity. And, since blog reviews allow the blogger to comment on the comments made by reviewers, sometimes an articulate, involved, even researched debate emerges from amongst the informal social bantering of others on a site. These exchanges can present diverse worldviews, and often provoke thought on both sides if conducted with open-mindedness, which is available in shockingly large degrees compared to other commentary sources. Compared to the inaccessible world of the newspaper or television commentary shows, it is no wonder today’s generations are involving themselves with this new form of social exchange and commentary; they are offered the chance to respond here. Blog reviews are not simply lists of vacant babblings and unilateral condemnations, they can be the site of real human exchange and development.